I have a good friend at work that some of you may know. I call him Billbur, and he's a fellow rennie and a lot of fun. Yesterday we were talking and the subject came around, by accident, to the X-Files. He asked me if I was a fan and I said that I wasn't, but I had been a big fan of Kolchak, the show that inspired the X-Files. A few more minutes of discussion led to an argument about the name of the series that starred Darren McGavin as Kolchak, an intrepid newsman who investigated the paranormal. I said it was Kolchak: the Night Stalker. He swore it was The Night Stalker, no Kolchak. I kept insisting that I was right, even specifying the colon in the name. Finally, he looked on Google, and guess who was right. I tried to explain to him that I don't argue about facts unless I know I'm right. I've had this discussion before, and am usually misunderstood. It's not that I think I'm always right. In fact, the opposite is true. My memory is so bad, that I am usually unsure of my facts, so I won't argue about dates, names or trivia because I assume I'm remembering wrong. The only way I will insist that I'm right is if I KNOW I am right. In this case, I had just watched the show on DVD and could picture the DVD case in my hand. 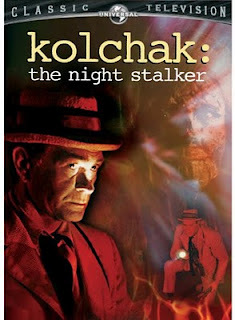 Besides, it's a family favorite, and we've called it Kolchak: the Night Stalker since the 70s. The only reason I bring this up is because I was thinking about writing a review about The Hunger Games. I liked the book fine and the movie was enjoyable, but I wouldn't say it was my favorite and I saw quite a few flaws in both. Here's the thing, though... if we were together in person, I would love to discuss my opinion with you and listen to yours. We could talk for hours about what you did or didn't like and what I did or didn't like and where we agreed and didn't agree. We could even argue about it, and I would not have to be right. I just don't want to do it here, where it's all so one-sided. I guess it's easier for me to argue facts than opinions. For who is to say that I'm right and you are wrong? You might see merits in a book that I miss or it might strike a chord with you where it didn't with me. So, I'll just say (this time at least) that it was pretty good, and leave it at that.